Welcome to Cub Scouting. You and your son are beginning on a trail of fun and adventure that will challenge him and allow you to share some unique experiences. As a Cub Scout, your son is a part of a group of boys his own age called a den. With his den, your son will build confidence and self-esteem and earn recognition. He will also gain a sense of personal achievement from the new skills he learns. Dens are usually between six and eight boys with one or two parents who are the Den Leaders. Most dens meet once or twice a month. The boys have fun working towards their rank badges. When first starting out, all boys will earn the Bobcat Badge. Then first graders will be working towards Tiger rank; second graders towards Wolf rank; third graders towards the Bear rank, and fourth and fifth graders towards the Webelos badge and the Arrow of Light, which is the highest award in Cub Scouts. Boys can join at any grade. It does not matter whether they have achieved “younger” ranks. The pack is led by a cubmaster and is made up of all the dens in Pack 7. We are in the Liberty District of the Knox Trial Council. Pack meetings are held once a month; generally on the third Wednesday of the month (check the calendar). These meetings are a time for boys to be recognized for their accomplishments, and to have fun with skits, games, and ceremonies. The pack will also hold several special activities each year such as the pinewood derby, blue and gold dinner, a year-end campout, outings, and community service. The Pack Committee runs the pack. The committee is made up of den leaders, pack planner, cubmaster, committee chair and other parents who want to help our the pack. The committee meets once a month to discuss and plan pack activities, fundraising, leader training and advancement. All parents are welcome to attend. Parents are extremely important in Cub Scouts. A parent or guardian is a partner to the scout during their time in Cub Scouts. Parents help the scout to learn and advance. The responsibility for a boy’s earning of awards in Cub Scouting lies with the family, not with the pack. Some requirements are done at den meetings, but many are done with you! You can sign off on his requirements when you and your son feel that he has done his best. For Tiger Scouts (first graders), parents must attend meetings and activities with the scout. For all other scouts, we strongly encourage parents to attend but we do allow parents to designate another adult to have responsibility for their scout. Parents are not only important to the scout, but to the pack. Parent volunteers provide all of the leadership, plan and conduct activities, and help the leaders with meetings and activities. We understand that everyone is busy with other commitments, however the more support we can give the boys the better their experience will be. It is expected that a parent from each family unit volunteers at least once during the year. It can be helping with the Pinewood Derby, Blue and Gold Dinner, fundraising, campouts or other special activities. Your Den Leader may ask for help from time to time. We will have parent sign-ups at the October and November pack meetings. Please bring your calendar to the meetings. In addition, the Council is asking all parents to complete the online Youth Protection training (see below). In Cub Scouting you are a partner to your scout and have completed most of the achievements together. You will be asked, when you are available, that you stand with your scout during recognition. And, few times during the year we will have a quick parent pack meeting during regular pack meeting to help with decisions and organizing events. Dues for the 2017-2018 school year will be collected by the October Pack Meeting for returning scouts. They are $86.00 per scout and for an extra $12.00 you can get a subscription to Boy’s Life magazine. The Dues are used to pay our share of support from the Council such as trainings and insurance, pack meeting supplies, some Den meeting supplies and activities and the year-end campout. There are some events planned over the course of the year that may require an extra cost, but are optional for families. If you need financial assistance please talk to Joyce Keady (Committee Chair). For new scouts, applications and registration dues need to be turned in by October 1st. Email us at natickpack7@gmail.com if you have questions or need an application. If you come to the first meeting, we will have application forms available. This year we are doing only one fundraising event - selling wreaths. (In the past we have also done popcorn sales) The more money we raise the more events we can participate in and help pay for. Every boy needs to have a Cub Scout uniform. The uniform is not required until fall. Tigers will be given a t-shirt for their uniform. For the older boys, we require an official BSA Cub Scout shirt with patches placed correctly (we prefer the blue shirt over the tan). We also require an official Cub Scout neckerchief and a neckerchief holder. Parents provide the shirt, initial patches, and neckerchief holder. 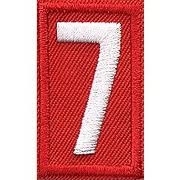 You will need the following patches: Knox Trail Council; the number 7 for Pack 7; BSA emblem; and den number. The pack will provide the rank badges (i.e., Tiger, Bobcat, Wolf, Bear, Webelos) and other awards. We do not require official BSA caps, pants, socks, or belts. All of these items are optional. Uniforms are available at the Scout Shop located in the Brickyard Shopping Plaza on Route 9 West in Southborough, just across the Framingham border. You can also purchase uniforms online at www.scouting.org. If you need financial assistance please ask the Committee Chair. The BSA has created a Youth Protection Program which all leaders and parents are required to understand and follow. This is especially important so that parents are all on the same page regarding youth safety. The training is an online 40-minute video with a few questions afterwards. Go to myscouting.org, in the upper right corner click “log in”. Set up a new account. You do not need a member number. Follow the website from there for “Youth Protection Training”. Print out or email the certificate at the end of the training to natickpack7@gmail.com. If you ever have any concerns about your boy in Pack 7, please contact the Cubmaster or Committee Chair immediately. You may also contact the Knox Trail Council (508.872.6551) in Framingham.